The Government has recently released some up to date and new statistics on motorbike accidents. 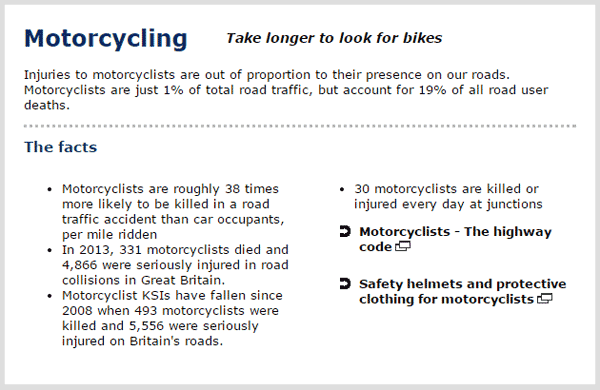 It makes for sobering reading, and highlights the fact that motorcyclists are in one of the highest risk categories of road user. You can see a synopsis of the report below. Motorbike riders are nearly 40 times as likely to be killed in a road accident when compared to those in a car or lorry. Over 300 riders were involved in a fatality in the year 2013 with nearly 5,000 suffering from a serious injury. If you have been unfortunate enough to be involved in an accident on your bike and have been injured then we can help. Today we launched our motorbike accident claims page which contains details on how you can claim for compensation.